That can be a dangerous question. But it’s an important question, a question we’re confronted with throughout our lives. From our earliest days, our parents ask us, “What do you want to be when you grow up?” A perpetual series of decisions — from the kinds of clothes we wear to the schools we attend to the friends we make — help us answer the question. People have long been infatuated with the idea of wish fulfillment. Sigmund Freud coined the term as far back as 1899. Of course, for Freud, he was referring to the satisfaction of an impulse or desire through a dream or through the imagination. 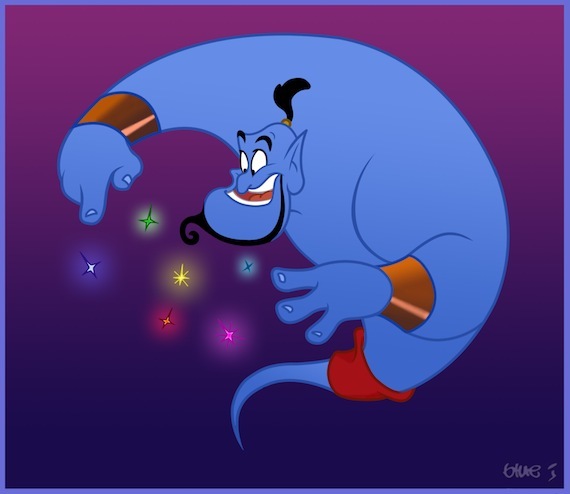 When you hear the phrase “wish fulfillment” you might picture the mythical story of the genie that appears out of a lamp to grant someone three wishes. In these stories, a person’s character is determined by what they ask for: if they ask for riches, then they’re done in by their greed; if they ask for vengeance, then they’re angry or bitter. This gets at the underlying issue of desire. Many times, we desire the right kinds of things; other times, we want the wrong things. Our lives basically exist in the tension between these two: which desires will win out? There is one Biblical character who is a prime example of this. Solomon was asked this very question: What do you want? Only it wasn’t some sort of Freudian dream or genie-in-a-bottle fairy tale. Solomon heard this question directly from the Lord in 1 Kings 3. As the text begins, King David has passed away and his son, Solomon, is seated on the throne. David’s capitol, Jerusalem, expands under the leadership of Solomon. In fact, verse 1 gives us a bit of a summary statement regarding Solomon’s administration. It says that he will build up Jerusalem’s city walls, he will build the temple of the Lord and he will build a palace for himself. One way to look at Solomon’s life is to look at the structures that he built. Each one of these demonstrates the desires competing within Solomon. City walls – built for the good of the people; serves to keep out predators, enemies. Temple – built for the glory of the Lord; a place for Him to be worshiped. Royal palace – built for gratification of self; it takes Solomon twice as long to build the palace as it does the temple. Solomon’s life is summed up by the structures he built. Each structure reflects one of Solomon’s desires. More to say about that in a moment. Solomon journeys to Gibeon and makes a tremendous sacrifice: 1,000 burnt offerings! This is an extravagant expression of devotion to God! As you’re going to see, Solomon doesn’t do anything halfway. And remember that number (1,000)…it’s going to come in to play again in just a moment. God is so pleased with Solomon that He says, “Ask for whatever you want and I’ll give it to you.” Can you imagine hearing the Lord say this to you? What do you say? This is Solomon at his best; he’s humble, doesn’t believe he’s capable of the task ahead of him without God’s help. So he asks for a discerning heart, which literally means “a hearing heart.” He wants to be able to hear, perceive, discern in order to properly govern the people. Solomon wants to hear the needs of the people in order to properly lead them. The word “govern” is also rendered “judge”. It’s the word used to describe the activity of the judges in Israel who would deliver the people from the oppression of their enemies and lead them properly. Elsewhere it’s used to hear the case of the poor and the downtrodden. This is so interesting: Solomon has a blank check from God; ask for whatever you want. And he asks for something that will benefit the people. Such a selfless request! So back to our three structures: this same desire leads Solomon to build up the walls of the city. It’s for the good of the people. Application: Do you have a desire to do something good for the sake of your fellow man? To serve the world? This is a good impulse, a good desire. Jesus tells us to pursue this impulse, to love our neighbors. But that’s not all Solomon asks for; he also wants a discerning heart in order to properly listen to God, to have spiritual perception, awareness that he might be able to discern between right and wrong. Solomon wants to do right in the eyes of the Lord; he wants to glorify God. And this is the same sort of impulse that will lead him to build the temple. And this is no small task! Solomon wants to create space for God to be properly worshipped. He’s made 1,000 sacrifices at Gibeon; now he wants a place where God can be worshipped continually. Application: Can you see how this relates to you also? In your time as a Christ follower, you’ve done much to build up the temple of the Lord. Maybe you’ve gone on mission trips around the world, but I’m willing to bet you’ve also been a vital part of the Lord’s church here at home. You’ve shared Jesus with your friends; you’ve demonstrated the love of God to the people around you. Solomon’s love for God led him to build the temple; your love for God has animated you, too. But it’s this last structure — the matter of the royal palace — that gets Solomon into trouble. Let’s look at 1 Kings 11. Ch10 is basically summarized in one verse, v23: King Solomon was greater in riches and wisdom than all the other kings of the earth. God grants Solomon his request and then some…gives him wealth and prestige and tremendous knowledge. We might say Solomon had it all. And the Lord was angry with Solomon, because his heart had turned away from the Lord, the God of Israel, who had appeared to him twice. Solomon’s appetite has tragic consequences. His appetite for political expansion leads to all of these arranged marriages. His sexual appetite contributes to this huge number of concubines as well. And once again, we see that there’s no such thing as partial obedience. Accommodation always leads to enslavement. Solomon takes into his royal palace 700 wives – princesses, royal arranged marriages – and another 300 concubines (viewed as something like a “secondary wife” in a polygamous culture). Even if you take into account that some of these marriages are political arrangements, this is still an obscene number that is indicative of the unchecked passions that will bring Solomon down. Do you remember those 1,000 sacrifices Solomon made before the Lord at Gibeon? I can’t help but note the symmetry of these 1,000 women and what it says about them in v4: As Solomon grew old, his wives turned his heart after other gods, and his heart was not fully devoted to the Lord his God. Solomon’s emphasis on his royal palace – and the gratification of self – leads to the construction of a final structure: high places, locations for idol worship. Ashtoreth (v5) – God of Sidonians; worship involved ritualized prostitution w/ both male & female prostitutes serving as “priests” in the cult. Molech (v5) – God of Ammonites – detestable worship practices, including child sacrifice. Chemosh (v7) – God of Moabites – also required child sacrifice. Now Solomon willfully turns back to this god; Chemosh has infiltrated the promised land of God by infiltrating the heart of the king. How did this happen? Solomon was the king who had it all. What happened? Solomon’s desire for gratification of self began to outweigh his desire to do good on behalf of the people…and it certainly became stronger than his desire to glorify God. As Solomon wrote in Proverbs 19:3, A man’s own folly ruins his life. The question you have to ask yourself is this: What do you really want? What mark will you leave on the world? Will it be a life of self-gratification or selfless service to the world? Will it be a life spent in the worship of the One True God or one of the false gods of our age? This entry was posted in Devotional, Faith, Scripture, The Story and tagged 1 Kings 11, 1 Kings 3, Desire, Solomon. Bookmark the permalink.